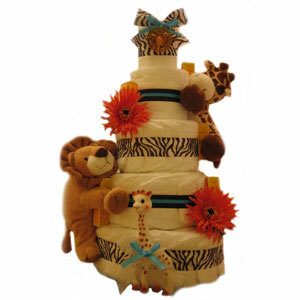 Our Organic Safari Deluxe Diaper Cake is a very popular choice for Eco friendly Baby Showers. Made with 5 layers of Nature BabyCare Diapers and decorated with organic accessories, high end ribbon, silk flowers and more, this beautiful baby shower centerpiece makes an impeccable baby gift for parents awaiting a baby boy. We choose to use Weleda Baby Care Products because they protect the baby's skin using the gentlest and most natural ingredients, such as Calendula, beeswax and almond oil. The 5 Piece Starter Kit gives mom the opportunity to try out a variety of their products.